Every now and then, the Transit Society Museum of Vancouver (TSMV) sends Vancouver’s old heritage buses back to the streets. Heads will turn again on select dates in August and September when a 1954-built, CCF-Brill trolleybus returns for “fan trips” to celebrate the 70th anniversary of Vancouver’s trolleybus system. 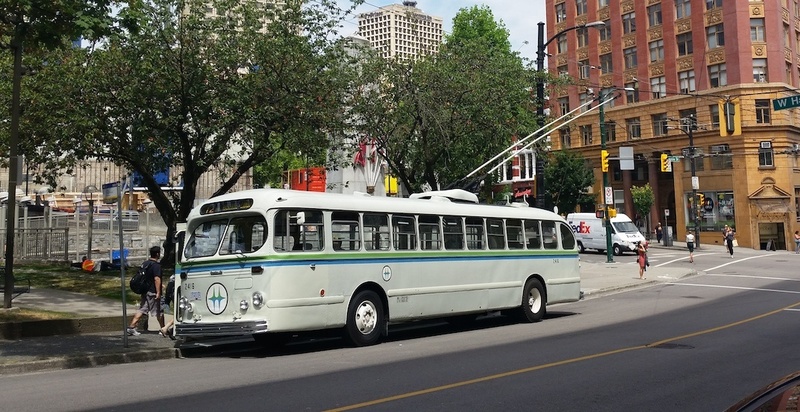 This specific bus was restored years ago, and its exterior livery is still authentic: It has the BC Hydro logo, as the province’s electric utility was in charge of operating these electric-powered buses decades ago. However, it is important to note that the upcoming trips are not part of the regular transit service operated by TransLink. Fares for the special anniversary trips on the vintage bus are $25 for an adult and $15 for a child, with proceeds going towards TSMV’s initiatives of maintaining and restoring heritage vehicles of the region’s transit system. Each trip lasts for four hours. Vancouver’s first trolleybus went into service on August 16, 1948, when the region began abandoning its interurban streetcar system in response to falling demand from the growing use of automobiles. TransLink’s current fleet of trolleybus vehicles were acquired just before the Olympics, and it sold its prior fleet built in the 1980s to a transit system in Argentina.